Frank Otto Haubold was born March 23, 1906 in Union City. A superbly coordinated and flexible young man, he developed his gymnastics talent in the Swiss Turverein near his home. Frank competed in regional competitions as a teenager and graduated to national tournaments in his 20s. His specialty was the pommel horse. Frank made the 1928 U.S. Olympic team and competed in the Summer Games in Amsterdam. He performed poorly by his standards, failing to compete for a medal. The U.S. team finished seventh overall. Frank bounced back from this disappointment to become the national all-around champion in 1932, and won individual titles in the pommel and parallel bars. At the 1932 Olympics in Los Angeles, he was the top U.S. gymnast, winning bronze in the pommel and helping the U.S. team take the silver medal. During the men’s individual all-around he finished first in the pommel, but placed sixth overall. Frank continued to compete at a high level as he approached 30. He also married fellow gymnast Irma Pezzia, a neighborhood girl everyone called Chip. 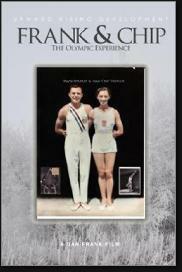 Both Frank and Chip made the 1936 Olympic team, becoming the first husband and wife to compete at the same summer games. Frank and Chip worked jobs to support their gymnastics career during the 1930s. A few years after the 1936 Olympics, Frank took a job as a textile salesman and worked for the same company for more than four decades. For much of that time, he served as president of the Swiss Turnverein. He passed away in Ridgefield in 1985.